WUWT Gets Weirder by the Day - Now burning fossil fuels doesn't produce CO2? A new bout of craziness has broken out on WUWT, this time led by Girma Orssengo, PhD. 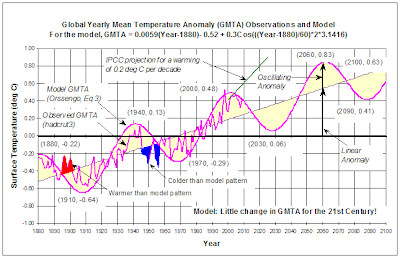 Girma posted an article entitled: Claim: How the IPCC arrived at climate sensitivity of about 3 deg C instead of 1.2 deg C.
Girma's sixty year cycle based on sixty years of observations! Nice headline. But Girma proceeds to do something else entirely - as many commenters point out. He reckons there's a sixty year cycle, based on his 'analysis' of temperatures over the sixty years between 1940 and 2000 or thereabouts. I kid you not! I won't try to delve more deeply - that should be enough to give you the picture. 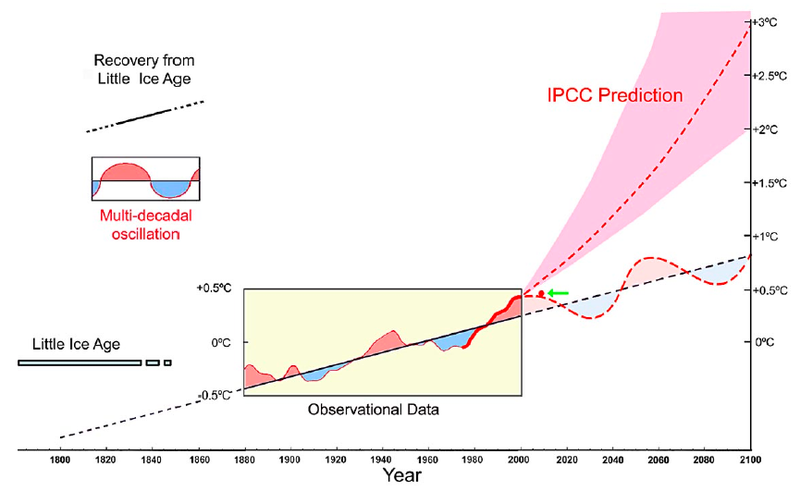 If you want to know how the IPCC report deals with climate sensitivity - click here. Climate sensitivity is the doubling of temperature from a rise in CO2 that is being outgassed by the oceans as a result of the rising temperature (and that are in fact absorbing, not emitting CO2). Burning fossil fuels doesn't release CO2 - what? I am not saying CO2 is causing the warming. I believe it is the warming that is causing the increase in CO2 concentration, as the vostok ice cores show. The CO2 concentration will drop when the temperature falls. As the temperature increases, more CO2 is released from the oceans (where it is about 50 times than in the atmosphere) increasing the CO2 concentration in the atmospheric. As the temperature decreases, more CO2 is dissolved in the oceans decreasing the CO2 concentration in the atmosphere. When temperatures change as a result of forcings other than CO2, carbon dioxide does outgas from the oceans as they warm. Small perturbations in temperature from orbital changes can produce much larger shifts in temperature because of this CO2 feedback - ending an ice age or plunging into one. Read more about the greenhouse effect in this booklet from the Bureau of Meteorology. But that's not what's happening now. The oceans aren't releasing CO2. They are absorbing about half the CO2 we pour into the air each year at the same time as they are warming up. That's evidenced by the fact they are getting more acidic. However, Girma doesn't even seem to think that burning hydrocarbons produces carbon dioxide and he's ignoring that little detail of ocean acidification. 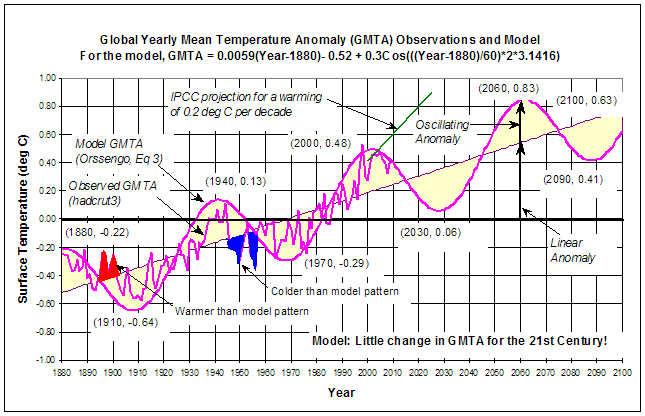 So how does Girma explain the rise in temperature? Well, that's a puzzle. He refers back to his oscillation - but as Russ R. says: Shouldn’t the trend over a complete 60 year cycle be zero? Otherwise, it must be magic. Just what does Girma mean by climate sensitivity? Next one has to try to figure out what Girma's original article on climate sensitivity is all about. Climate sensitivity is the rise in temperature from a doubling of CO2 (in this case). Given Girma has said that it's the temperature increase that's causing more CO2, then his climate sensitivity can't be a measure of temperature rise from a doubling of CO2. Maybe it's the doubling of CO2 from a given temperature rise? Weird. May 18, 2013 at 5:57 am All sensitivity figure are wrong, because there is no linkage between CO2 and temperature. REPLY: John O’Sullivan, leader of the Principia cult, there’s no need to hide behind a fake email address. We always know who you are here....(inserts email rejection etc here)...Anthony. May 18, 2013 at 6:51 am What ever happened to ’cause-and-effect’ in science? Just because temperature went up and CO2 also went up over the same period doesn’t make a basis for calculating how much temperature will go up as CO2 increases! This whole analysis is based on the false premise that temperature is a function of CO2. Why don’t we do the same analysis for the period 1945 to 1977 and calculate how much COOLING occurs with increase in CO2? And why don’t we calculate for the period 1880 to 1915 how much COOLING occurs with increase in CO2? And why don’t we calculate for the Maunder Minimum how much COOLING occurs with increase in CO2? You get the idea–the notion that temperature is a function of CO2 is invalided until you first show a cause-and-effect relationship between the two! May 18, 2013 at 8:14 am Climate sensitivity is not a constant. It is variable and dependent upon other factors. That is due to the chaotic nature of climate. When near an attractor state it will be small. The further away it gets the higher it will be for any forcing. CO2 emission has nothing to do with global mean temperature as its patterns before and after mid 20th century, before and after wide spread use of fossil fuel, are nearly identical. Maybe Girma thinks that all the CO2 from fossil fuels are immediately absorbed by the oceans, but the oceans emit some other CO2 back at the same time. Does Girma offer any evidence for this? Surely if the oceans are outgassing CO2, pH would be rising, not falling. Surely, this fairy-dust reaction is better than cold-fusion! Plus we don't need to store it any place! Girma Orssengo PhD's latest work overtly references the School of Akasofu, so much so that some critics have suggested that the artist has come dangerously close to pastiche. I think this is a reflexive and limited interpretation of the piece. To me, it ignores Orssengo's ironic use of colour and exuberant labelling. The restrained pastels and textual minimalism characteristic of Akasofu are playfully subverted with a garish panache that evokes the punk aesthetic of spraypaint graffiti and three chord thrash. we have measured a decrease in outgoing radiation (heat) that is specific to the co2 absorbance spectrum. IOW we have measured a decrease in escaping heat because co2 is trapping it. I agree judging this years Moron of Morons will be tough! All entrants are highly credentialled,and in excellent form this spring.